It's not often I'm actually bored by a comic book, but I found myself impatiently flipping pages a couple times in Convergence: Zero Hour Book Two. This is unfortunate, both because I enjoyed much of the previous Zero Hour book, and also because there were plenty of classic 1990s properties I was eager to revisit here: the Matrix Supergirl and Steel John Henry Irons circa Reign of the Supermen, Azrael Jean Paul Valley as Batman around Knightfall, and Parallax Hal Jordan and Green Lantern Kyle Rayner from Emerald Twilight/Zero Hour itself. Unfortunately, each of these was formulaic, at the least, if not also derisive of or oblivious to the source material; even the lone interesting story, the Aquaman miniseries, had little to do with the actual Aquaman of the period. At least part of the difficulty facing this round of Convergence tie-in miniseries is a lack of strong antagonists. The "villains" du jour are either Lady Quark and family -- throwaway characters, really, from a dead world in Crisis on Infinite Earths -- or otherwise 1990s Wildstorm properties. While each of these are fitting (circa Zero Hour was arguably Quark's heyday in LEGION), ultimately the Wildstorm characters hold up no better than their 1990s comics do. In Batman: Shadow of the Bat, writer Larry Hama (whose own Batman run was troubled) devotes whole pages to bickering between Wetworks characters, as if the audience has any interest in them over Batman Bruce Wayne and Azrael. In Superman: Man of Steel, the Gen 13 characters come off similarly generic, and with surprisingly hackneyed dialogue as well. But moreover, these characters are often poor imitations of their former selves. If Azrael, as Hama's story suggests, comes from post-Knightsend, then his ultra-violent attitude (instead of a repentant one) makes no sense, nor why he purposefully antagonizes Batman (as if this were Jason Todd and not Jean Paul Valley). 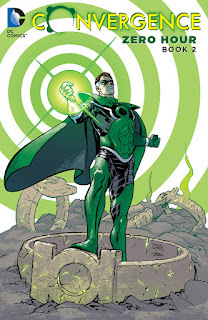 I thought Tony Bedard might actually explore a Hal Jordan who comes to understand Parallax's artificial influence (retroactively addressing the post-Green Lantern: Rebirth retcon), but instead Parallax is needlessly vengeful in a way that doesn't match his Zero Hour portrayal; Bedard also references adventures for Kyle Rayner that he wouldn't have had at this time. The pairing of Power Pack's Louise Simonson and June Brigman doesn't have much resonance for me as a DC fan, and the story focuses more on Steel's niece and nephew than on the hero himself. Further, Keith Giffen's Supergirl: Matrix story is a real disappointment for an actual fan of the character. Certainly I recognize Giffen's work is often satirical, and this is meant to be such. Also that between Matrix, Ambush Bug, and Lady Quark, Giffen's story is more a send-up of the 1990s itself; if this had been an Ambush Bug story guest-starring Matrix and not vice versa, the tone might be entirely appropriate. But not only is the story silly, but also Giffen posits some odd continuity for Matrix and Lex Luthor II (the original Lex in a cloned body) where Matrix actually knows Lex is a bad guy but is still working for him, which doesn't fit the characters at all. I don't disagree that Matrix's character is absurd in a certain light, but she can also be taken seriously (see the Supergirl and Team Luthor special), and when we haven't had a Matrix story in so long it's unfortunate that it ends up the site of Giffen's antics. Artist Timothy Green has plenty details wrong, from Lex II's facial hair to the iconic LexCorp tower itself. The lone bright spot in the book -- and even this seems somewhat accidental -- is Tony Bedard's Aquaman. Except for the fact that Aquaman has a hook for a hand, Bedard doesn't really use any important continuity from the era, and rather his "gets no respect" Aquaman is more tonally similar to Geoff Johns's New 52 Aquaman than to the Peter David version. That said, Bedard's exploration of how Aquaman deals with having no significant accessible water under the Convergence dome is very interesting, and there's additional entertainment in how shockingly bloody Aquaman's battle with Wildstorm's Deathblow is. In another book this story might not actually rank that high, but its surprises are notable given the predictability of the rest. Unfortunately Convergence: Zero Hour Book Two ends the Convergence tie-in books I was really looking forward to. For completeness I'll read the Crisis and Infinite Earths books, but to some extent that's more of an academic exercise in visiting DC's historical properties; Flashpoint and Zero Hour were the miniseries that really had my heart. I won't be so maudlin as to say "you can't go home again" because I've enjoyed some of these ventures, but the last Zero Hour book leaves me more in mind of the failures than the successes.